This is a guest post by John Haydon, who will be hosting a full session on Membership Funnels at this year's Membership Growth Online Summit, taking place from April 4th - 8th. I know you’re familiar with the idea of a marketing funnel. Here’s one going from awareness to close, and one going all the way to loyalty. The funnel (shown above) begins when someone joins your e-mail list and ends when they become a member. They might be Facebook fans and Twitter followers, but until they join your email list, they won’t be a member any time soon. Everything changes when they join your e-mail list. At that point you can use e-mail marketing tactics to increase the likelihood that they’ll become a member. The top of the funnel represents the initial point when they joined your email list or campaign. They’ve opted into an email list in exchange for something valuable, like an e-book, or a giveaway. Or maybe they signed a petition. The middle part is where you nurture fresh emails, gently nudging them towards becoming a member. For example, let’s say someone signs a petition, and then receives an email encouraging them to share the petition with their friends. This can be set up as a simple follow-up or drip campaign in any email marketing software. But then you want to ask ONLY people who shared the petition to become members. For people who didn’t share, you can ask them to share it again (with a mention of signing up to become a member as a P.S.). This approach will increase your conversion rate AND lower your unsubscribe rate. 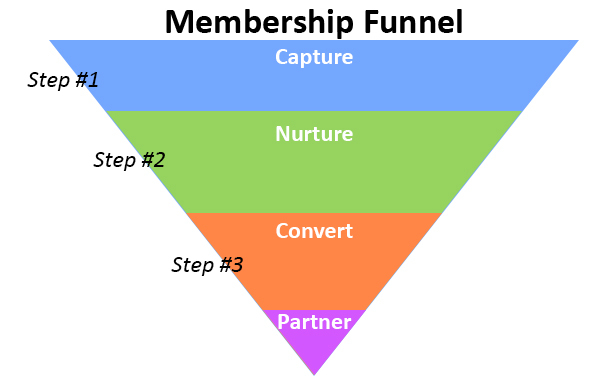 The bottom part of the funnel is where people actually become members. But this doesn’t mean you’re done. Survey your members. Understanding what makes them tick helps you retain them as a member. Plus, you’ll have more fodder for creating ideal marketing personas! Use this as a starting point to make your own funnel, but keep it simple. I'll be diving even deeper into how to build out your marketing funnel at the Membership Growth Online Summit on April 4th. Join me at the summit, by clicking the link below. 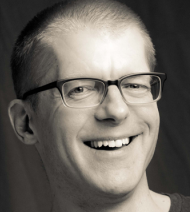 John Haydon is the author of Facebook Marketing for Dummies and Facebook Marketing All-In-One (Wiley), and is a regular contributor to the Huffington Post, Social Media Examiner, Social Media Today, and npEngage. How do you set up analytics in Wild Apricot to track your funnel conversion rate? Thanks for writing. You can use Google Analytics to do this. Simply follow Google's instructions to paste the embed code into the pages you want to track. Wild Apricot also allows you to track opens and clicks of the emails that you send, which is useful for tracking conversion. Thanks but the directions are for page views but your system doesn't change the url when you move from screen to screen. You're seeing the same URL because you're likely logged into your Admin View. However, Google Analytics will track the "public" side of your site. I think it's easiest if we get in touch with you directly. Do you mind emailing (support@wildapricot.com) or calling us (1-877-493-6090) when you get a chance? Explaining exactly how these funnels work in Wild Apricot would be enormously helpful. Chis's question is one I've been wondering about too - How do you set up conversions in Wild Apricot? As a non admin user, after a new membership signup, or successful event registration (Whenther a "member" or not) people SHOULD be taken to a "thank you page", so that the admins can sett those URLs up as Google Analytics Goals. There should be distinct URLs for each type of conversion action, from email signups, to contact form completions or whatever. However, this is not possible in Wild Apricot, since the URL doesn't change after a payment or other "success". The URL's change through the funnel up until payment or completion, then the events happen on-page without a change. If I'm missing something obvious please correct me, but without destination URLs, how would we set up Analytics goals? Also related, on those "thank you pages" it would be nice if they could drop in additional conversion code, like from Facebook, Adwords, etc. so they know whats working and what's not.